(Middle East, 20 March 2019) On July 10 2019 Bentley marks its 100th year. To celebrate this remarkable milestone we have created the new Centenary Collection which is available to order now. The pieces in this limited edition collection feature the Bentley ‘100 Extraordinary Years' alongside Centenary gold detailing similar to those that appear on every car built during this very special year. The spirit and style of an incredible century is embedded into every piece. For the home, the exquisite gold-plated tealight holder and set of two napkins rings featuring the distinctive Bentley knurling pattern will enrich any dinner table; the centenary espresso set of two cups with saucers, featuring a hand-painted gold coloured rim, will make a special event of any cup of coffee. Centenary clothing accessories for men and women include stylish polo shirts with the ‘Crewe' landmark logo on the front, the Centenary logo on sleeve and Centenary gold detailing, creating stylish additions to a leisure wardrobe; cufflinks inspired by the Bentley driver control system switch featuring iconic facet-knurling, Centenary gold-coloured plating on the face and laser-etched Bentley emblem on the rear will add a sophisticated element to business attire. Other accessories include practical notebooks and lanyards available to make an occasion of the everyday. These collectible pieces are available along with other new products including heritage luggage and a selection of exquisite home accessories. Many of Bentley's most popular pieces are also still available, including luxurious handbags, sumptuous leather jackets, contemporary clothing and stylish business accessories including the Graf von Faber-Castell for Bentley pens. 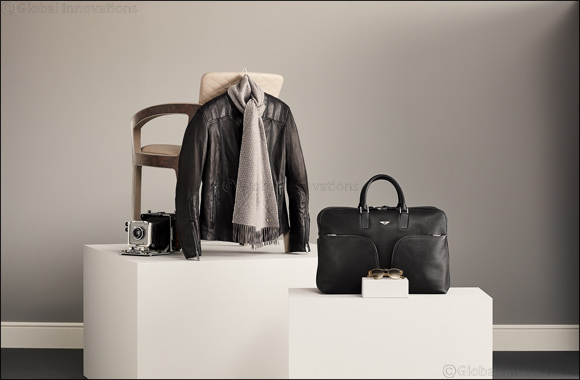 Every item captures Bentley's inherent qualities of craftsmanship, tradition, exclusivity and style. With many items lovingly crafted by highly skilled artisans, the Bentley Collection takes our exciting heritage and vision for the future, and seamlessly weaves it into extraordinary statement pieces. Bentley's style reaches far beyond the worlds of fashion and car design. Our range of clothing and accessories is crafted around the lifestyle that has long been associated with the Bentley world and subtly draws inspiration from inimitable Bentley design accents. Signature pieces in the collection such as the iconic leather jacket feature the same intricate detailing that goes into each Bentley car. Our pure cashmere woven scarf artfully showcases the distinctive Bentley diamond quilting pattern and the contemporary briefcase takes inspiration from the memorable wing shape of a Bentley dashboard. In addition, our Heritage Collection is a set of exquisitely crafted pieces paying tribute to Bentley's rich racing history, one that stretches back to the Bentley Boys and their string of 1920s victories at Le Mans. Influenced by classic colours and materials, while also adding a distinctly modern feel, the range exudes effortless, relaxed style with a dash of flair. With elegant clothing, stylish luggage and adorable toys, the collection truly has something for everyone. So whether you're engaging in the world around you or relaxing in the comfort of your home, you can do so in style with items from the Bentley Collection, and now our new Centenary Collection limited edition collectibles. Useful and stylish, the Bentley Collection's unique range of clothing, accessories and home products have been designed to fit perfectly into your lifestyle.